Hello! 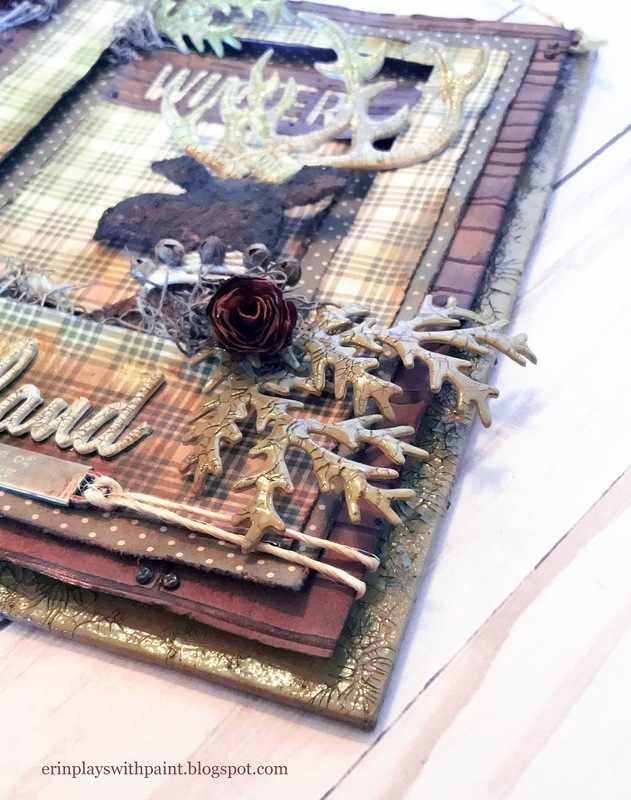 Today I'm sharing a project featuring the fabulous Tim Holtz Dashing Deer die. I hope you like it! I started with a 7x9" thin canvas panel. 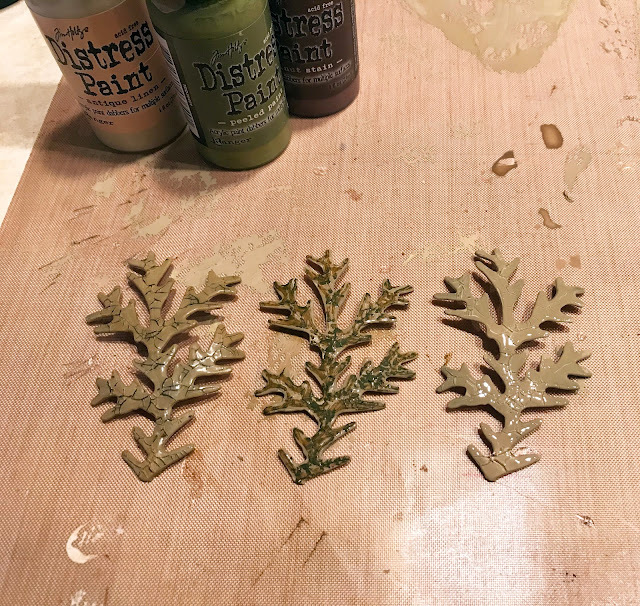 Added a layer of gesso, then a mixture of Distress Paints (2 parts Peeled Paint, 1 part Antique Linen, 1 part Walnut Stain). After the paint was dry, I applied Distress Crackle randomly and then a Distress crayon to highlight the cracks, wiped back with a baby wipe. Next, I wanted to create a layer resembling wood. I started with white heavy cardstock and colored it with Vintage Photo and Tea Dye Distress Stains. Next, I embossed the Tim Holtz Wood Planks Texture Fade and then highlighted the raised texture with Timber Brown StazOn ink. From some of the leftovers, I cut the word WINTER from the Holidays Words Block die and three pinecones from Tim's Tattered Pinecone die. The foliage, also from the Tattered Pinecone die, were coated in the same paint mixture as the canvas, covered in crackle glaze, and then covered in Distress Crayon and wiped back with a baby wipe to bring out the cracks. For the deer: I used Tim's Dashing Deer die and cut several shapes from heavy white cardstock, glued them together for a thicker piece, and covered in gesso. For the head and neck, I applied Basics coarse texture gel and once dry, painted with Walnut Stain and Black Soot distress paints. For the antlers, I painted with Antique Linen, covered in Distress Crackle Glaze, vintage photo distress crayon to accent the cracks. The antlers were coated with a layer of Glossy Accents and a dab on the nose. 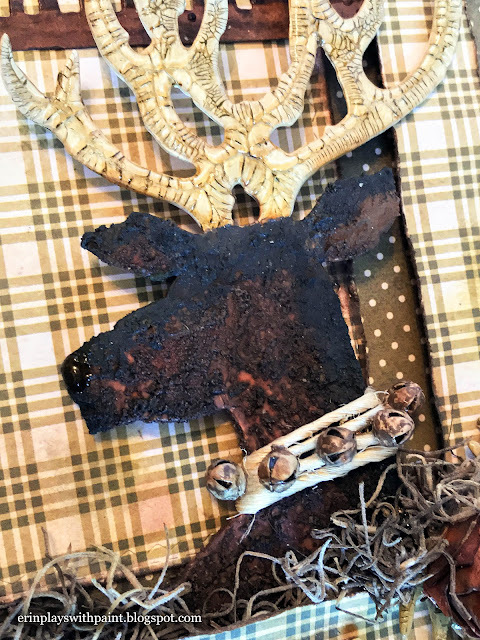 I wrapped some twine around the neck and added some mini jingle bells that had been painted with Vintage Photo. Next, I cut some papers to size from Tim's Yuletide paper pack, and used the Stitched Rectangles die in the center. 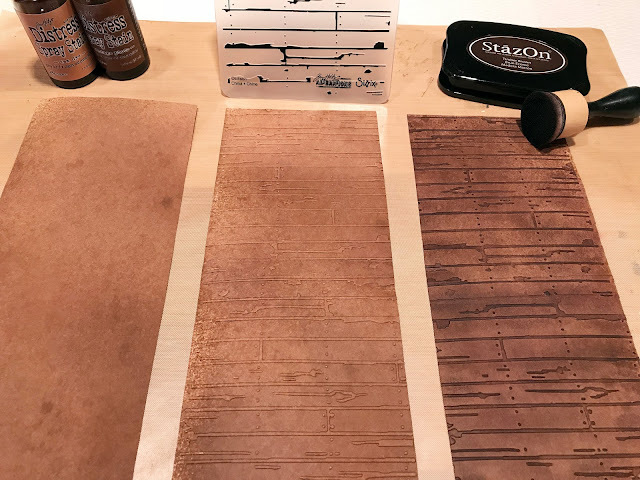 I distressed and inked the edges with vintage photo, walnut stain, and tea dye. I used Ranger Adhesive Foam Tape to adhere them with dimension so I could tuck in the deer, leaves, and pinecones. 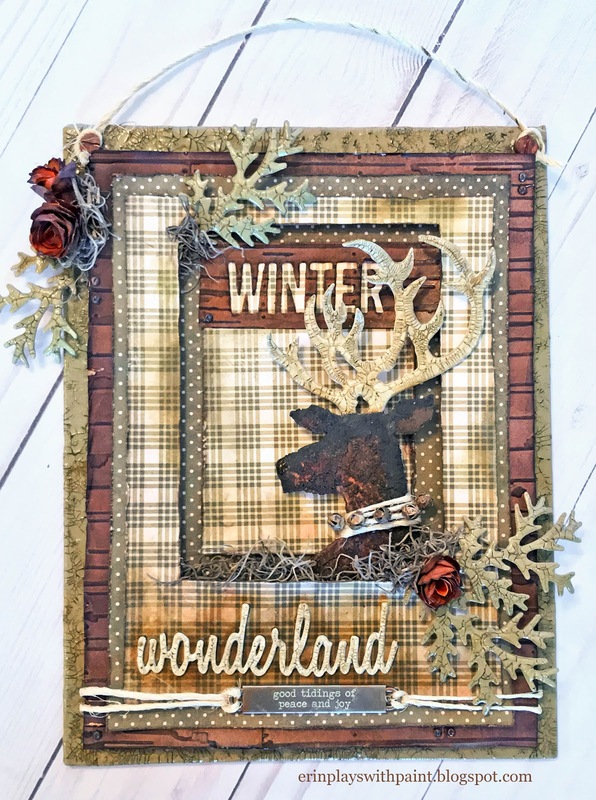 I cut Wonderland from the Holiday Words Script die, gluing several cuts of heavy cardstock, and giving it the same treatment as the antlers: gesso, Antique Linen Distress Paint, Crackle Glaze, Vintage photo crayon in the cracks, wipe off, then a coating of Glossy Accents. 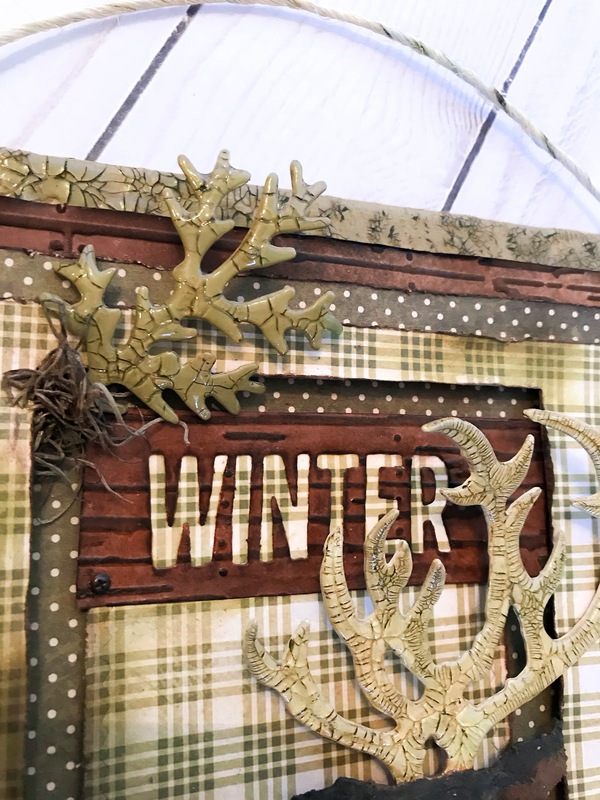 For the finishing touches, I added some Spanish moss around the deer and pinecones, some of Tim's mini fasteners to the wood planks, and a Christmas word band with twine. For the hanger, I drilled two holes in the top and added some twine and Hitch Fasteners. Hello! I've loved arts and crafts for as long as I can remember, anything creative feeds my soul. Love sharing this passion and getting inspiration from other right-brainers out there!